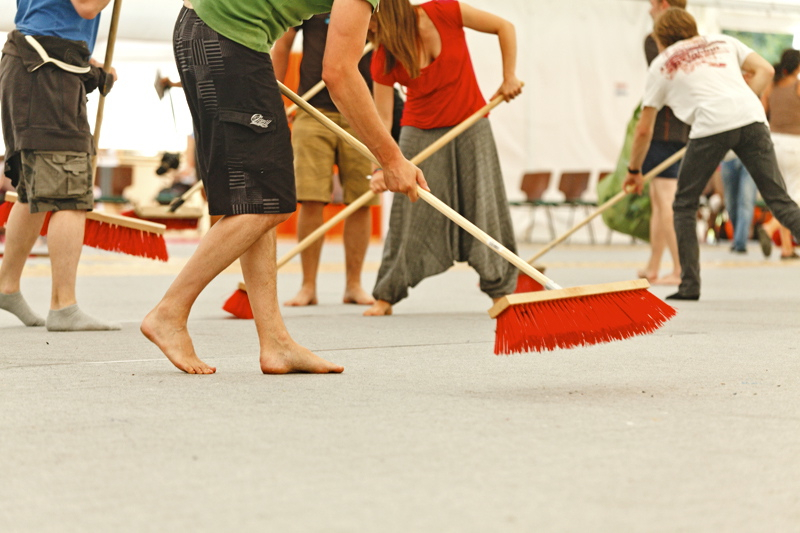 August 2012 saw our biggest ever Summer Course in the Europe Center, Immenstadt. 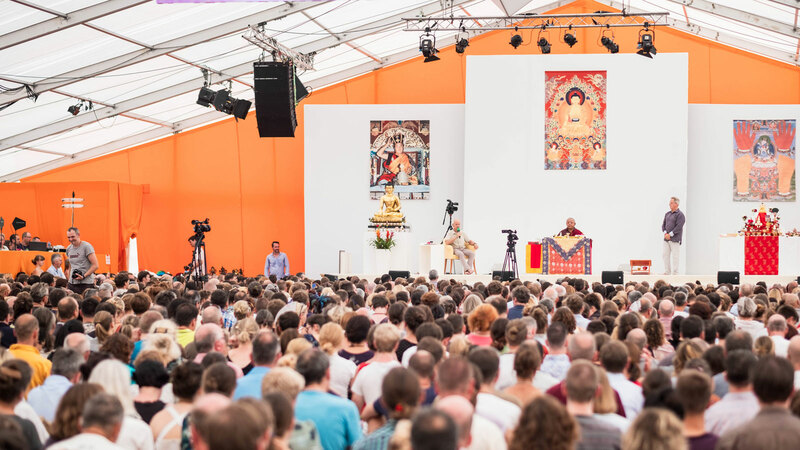 In a highlight of the Buddhist calendar in Germany and worldwide, several thousand students of Diamond Way Buddhism came together for an inspiring program of meditation, teaching and empowerments. Our great masters of Karma Kagyu Buddhism came to meditate with us and to teach. His Holiness 17th Karmapa Trinley Thaye Dorje and Lama Jigme Rinpoche, representative of H.H. 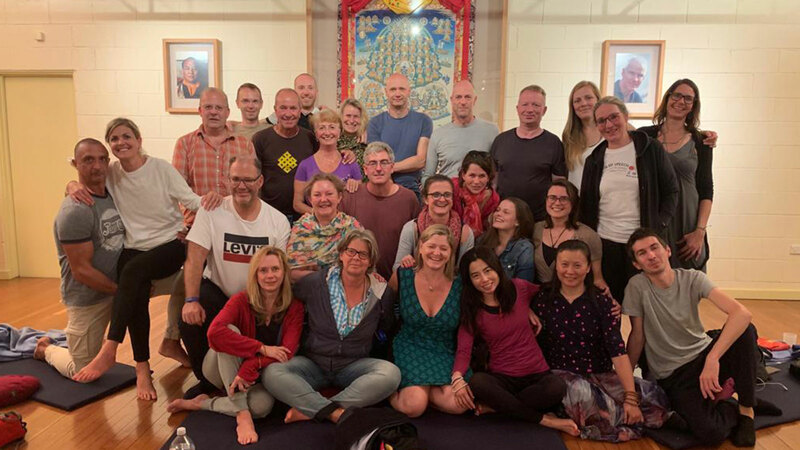 Karmapa in Europe joined Lama Ole Nydahl for the 2-week meditation course. To create such a huge meditation course, with thousands of hungry Buddhists on site at the height of the course, who all need to be fed, watered, shuttled, and accommodated in the cavernous meditation tent, takes a lot of effort. 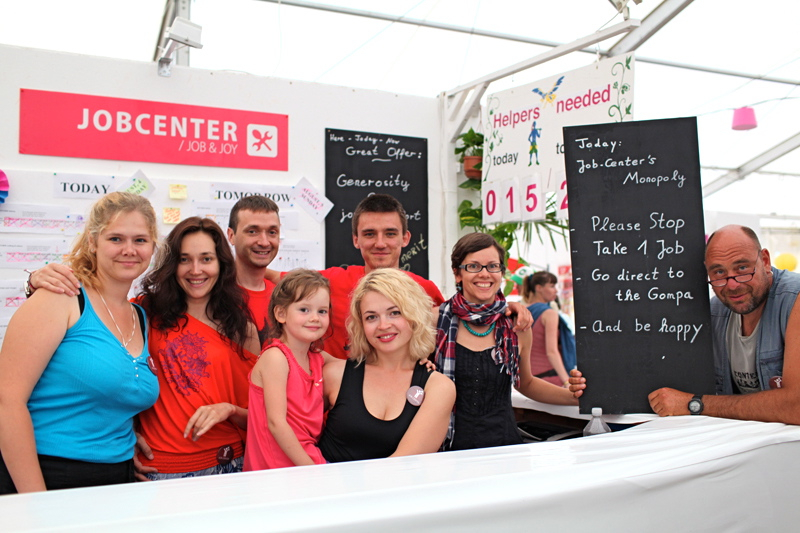 Hundreds of volunteers every day were recruited by the ever-joyful Job Center crew. They assisted the regular team in cooking, cleaning, translating, looking after children, driving visitors up and down the hill, manning (or woman-ing) the dharma shop, and all the other tasks that make this temporary, small Buddhist city function. Luckily, it was sunny when we raised the big tents. So much for perspiration. And inspiration? 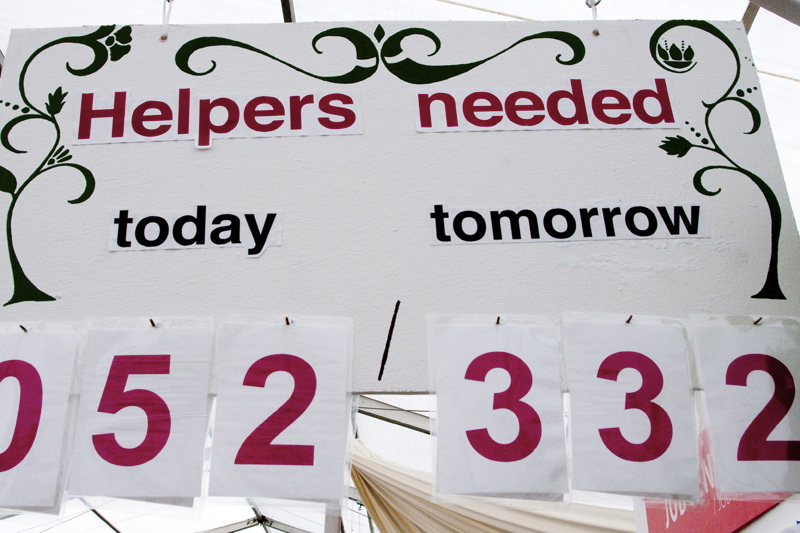 None of the onsite ‘staff’ or volunteers are paid. A naturally generous attitude, and an understanding of the preciousness of the Buddhist teachings are the reasons why people give up some of their free time that they could use for meditation, in order to create the conditions for others to meditate. The course began with a seven-day meditation on Conscious Dying, or Phowa in Tibetan. 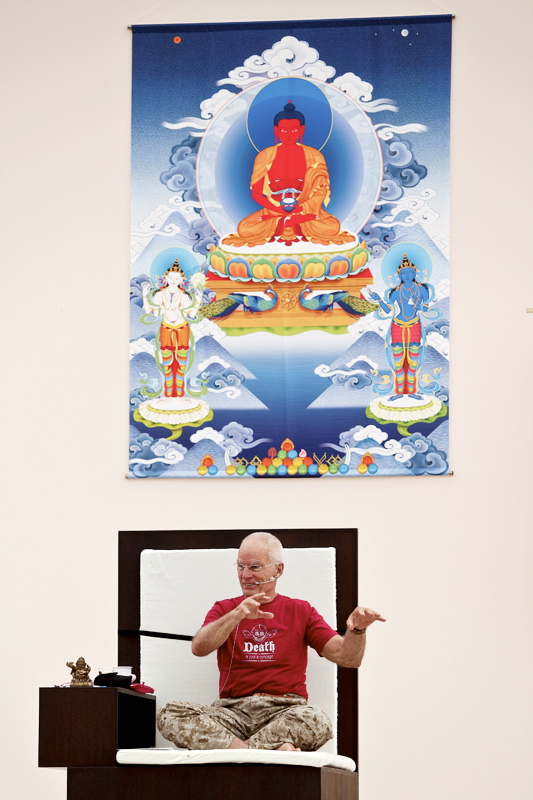 During a Phowa course with Lama Ole Nydahl participants have the opportunity to meditate for three sessions a day with a master of the practice. Phowa, one of the Six Yogas of Naropa, is a very rare and traditional method of Tibetan Buddhism. It was passed down from Naropa to Marpa a thousand years ago, and so became part of the Karma Kagyu teachings. By successfully completing the meditation, one learns to work consciously with the process of dying. 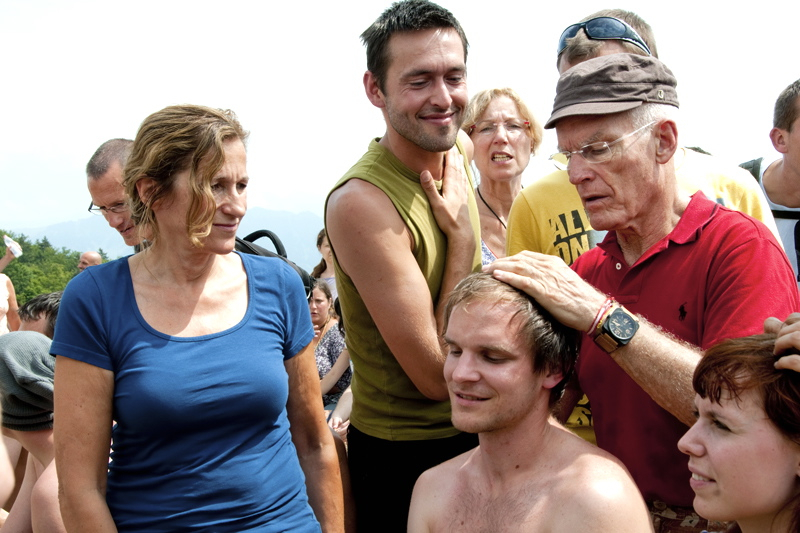 Lama Ole Nydahl, one of the few lamas in the world authorized to teach this practice, led 700 newcomers to the practice, accompanied by a few hundred old students, through the process of attaining the outer, inner, and secret signs of success in the meditation. For the first time, H.H. 17th Karmapa Trinley Thaye Dorje, head of the Karma Kagyu lineage of Tibetan Buddhism, gave teachings about the meditation on the 16th Karmapa. This meditation is the most common form of guru yoga, (meditation on the teacher) practiced in Diamond Way Buddhism. H.H. 17th Karmapa himself led his students in a 12-hour meditation on the 16th Karmapa, Rangjung Rigpe Dorje. This unique chance was a powerful way to start the part of course that focussed directly on the masters of the Karma Kagyu lineage. The much-loved teacher Lama Jigme Rinpoche happily also gave explanations to the thousands of assembled students about the meditation practice of guru yoga. As always, the audience appreciated Lama Jigme Rinpoche’s dry wit and deep wisdom, and the opportunity to ask questions about their meditation practice. Lama Jigme Rinpoche was sent to the West by H.H. 16th Karmapa Rangjung Rigpe Dorje, and is the official representative of Karma Kagyu Buddhism in Europe. 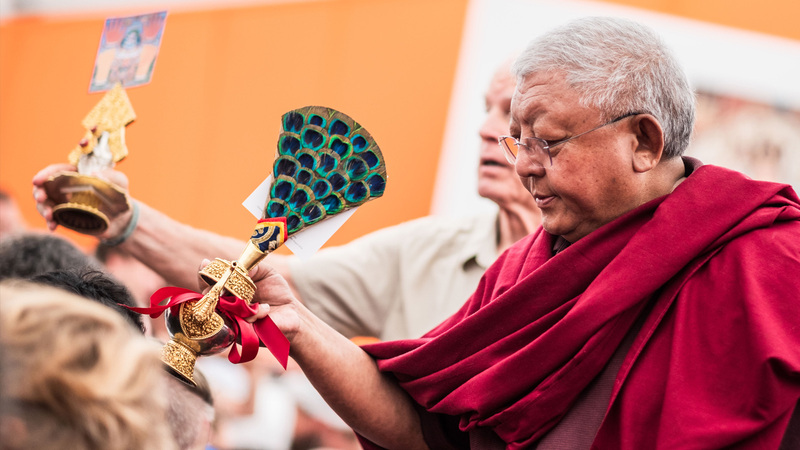 Rinpoche is based in France, and he travels and teaches throughout Europe. The inhabitants of the relatively small town of Immenstadt have got used to the Buddhists on the hill by now, and even come to meditate with us. Many of the local community came to see Lama Ole Nydahl as he gave a public lecture in German. Many came for the first time, and some must have found in Buddhism something that seemed useful for their lives, as they took Buddhist refuge at the end of the lecture. A Buddhist empowerment leaves strong positive impressions in the mind, and is essential for practitioners on the Diamond Way. Rechungpa was an accomplisher (yogi) of the highest meditation methods of Buddhism, who lived 900 years ago in Tibet, and was one of the teachers of the 1st Karmapa Dusum Khyenpa. The 1st Karmapa started the Karma Kagyu lineage. Rechungpa passed on important meditation methods that have been preserved in the Karma Kagyu tradition down to our time. The empowerment into Rechungpa was given by H.H. 17th Karmapa here for the first time at a Diamond Way course. Marpa practiced lay Buddhism, where practitioners meditate and also have normal jobs and families. Lay Buddhism is the kind of Buddhism that modern-day, Western Diamond Way Buddhists practice. Marpa went to India from Tibet on foot over the Himalayas three times to retrieve the precious teachings, and translated them into Tibetan. For this reason he is known as “the hero Marpa”, and “Marpa the Translator”. H.H. 17th Karmapa Trinley Thaye Dorje gave the empowerment into Marpa to a grateful crowd of thousands of students. The empowerment was a fitting crown to a wonderful, joyful course. Thanks to everyone who made it possible. We are already looking forward to the Summer Course in 2013!